Emotion Is The Engine That Drives Sugarland's 'Bigger' Sugarland's first album in eight years sees the country duo not only mount a comeback but address social crises in a grounded, unpretentious way. 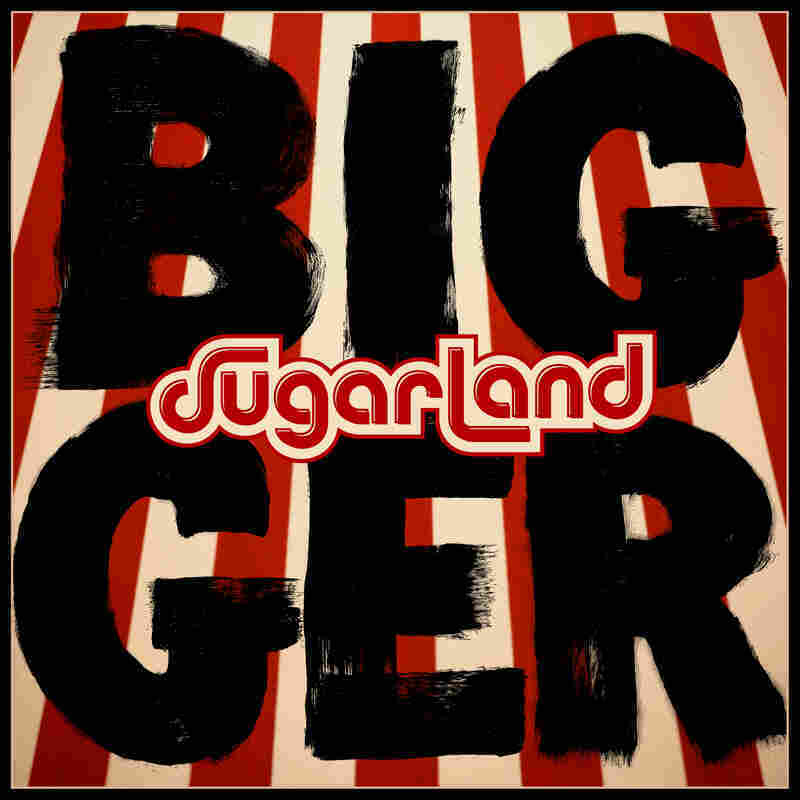 Sugarland's Bigger comes out June 8. During its initial run, from the early 2000s to the beginning of this decade, Sugarland helped nudge country-pop in a notably savvier direction. The southern singing and songwriting duo — comprised of friskily theatrical frontwoman Jennifer Nettles and her even-keeled, guitar and mandolin-picking foil Kristian Bush — took an outgoing, big-eared approach to the dialogue between Nashville and the broader world. Besides celebrating small-town struggle, contentment and aspiration and embellishing classic country heartache, they incorporated college rock covers, borrowed a trick from the cheerfully psychedelic spectacle of a Flaming Lips show and did some nutty sampling of steampunk and reggae aesthetics. Bush and Nettles had numerous reasons for putting Sugarland on hiatus in 2012, including family matters, solo projects, side pursuits, and a stage collapse at the Indiana State Fair a year earlier that killed and injured fans and brought on years of legal wrangling. But they no doubt also saw the writing on the wall: their native country format was veering toward swaggering male voices. Now that the bro country movement has peaked, if not entirely dissipated, the duo has reunited for its fifth proper studio album, Bigger, with the magnified bravado of a pop act mounting a comeback (see: the lead single). But the new set also represents a conscious scaling up of the perspectives that Bush and Nettles' explore in their songs and honing of their awareness of how they come across to various audiences. Filmed commentary for the song "Let Me Remind You," whose groove and vocal cadence have a slouching syncopation informed by reggaeton, says a lot about Sugarland's current state of mind. First Nettles qualifies what they're up to artistically. "We don't want to pretend that we're suddenly making a Latin song, because we're not," she emphasizes, seated on a sofa next to Bush. "We're not that. We wanna be us, but we're so inspired by this groove." Then she speaks to the underlying message of the song — a grown-woman's insistence on reclaiming a relationship's mutual attentiveness and sensuality, subtly calibrated for the #MeToo era. "Use this material if you want," she challenges those behind the camera (and, implicitly, her handlers), playfully deepening her drawl and pursing her lips, "and don't if you're too afraid." She goes on, "The truth is there's a whole arm of feminism that basically says if we focused on a woman's pleasure, we would never have to worry about violation." In one way or another, "Let Me Remind You," "Babe" (a breezy pop kiss-off supplied by Taylor Swift) and "Love Me Like I'm Leaving" (a modern power ballad with honky-tonk spirit) all give voice to female dissatisfaction. "I wanna show you, I'm gonna show you I'm worth more," Nettles belts during the latter song's outro. There's a perception that country music's valuing of familiarity and stability translates to insularity and a clinging to the status quo in its vantage points. But when Bush and Nettles reconvened to write, conscientiousness was creeping back into the country mainstream (in the form of mild calls for kindness and understanding) and they were were ready to address social crises in a grounded, unpretentious way. They distilled parental concerns, horror at the rise of school shootings, the influence of Civil Rights activist Ruby Sayles and and socially conscious Irish rock into the poignant ballad "Tuesday's Broken," borrowing Sayles' inquiry into human pain: "Where does it hurt?" In the broody pop-rock number "Birds in a Cage," Bush and Nettles obliquely decry abuse of both intimate and systemic varieties. The lyrics of the bridge acknowledge, in the simplest of language, that the perversion of a religious tradition can become oppressive for people: "Same hands that hold your prayer / Same hands that keep you there." In an accompanying video clip, Bush explains where he and his band mate were coming from, alluding to how his rural roots in the mountains of East Tennessee and his cultural encounters with difference combine in his present outlook. The country, bluegrass and white southern gospel traditions have no shortage of songs sentimentalizing motherhood, but Nettles and Bush make a new contribution with their sweeping acoustic tune "Mother." They nudge listeners to consider their experiences with mothering as moral models, as templates for empathy and unconditional, nonjudgmental acceptance. "When you're in love, she's got a ring to give to you she hopes you give away," Nettles rhapsodizes. "She don't care who you give it to, where they're from, if they pray like you. As long as they are good to you, that's enough. First thing she taught you was love is love." Later the focus briefly shifts from human parenthood to the Statue of Liberty as a symbol: "She's a beacon, a harbor." The song may be idealistic, but it also holds a certain earthy power. The merging of metaphors, Nettles underscores in her filmed commentary, "reminds us that the political is personal." Sugarland has found a way to stay in touch, with their audience and the broader world, by enlarging their scope on Bigger, and that's no small feat.